While gathering information on Isachsen's Arctic C-47 Wreck, I was told that a USAF C-82 Packet also suffered a fatal mishap at that very same airstrip at Isachsen. This crash probably happened early on, possibly even during the weather station's construction, which had started in April 1948. After the crash, the fuselage of this aircraft was brought to the camp and used as a storage compartment until at least 1962, and it may very well still be there today. Because of this possible link with today, I'd really like to know which C-82 this was, when the crash happened, what the circumstances of the crash were, and most importantly, if parts of this Packet are indeed still at Isachsen? A photo by Merlin Mac Aulay, showing the wing of a USAF C-82 Packet, with the engine still attached. It was taken during the summer of 1958. Click on the photo for a larger image. The first development came quickly, and it was unexpected. 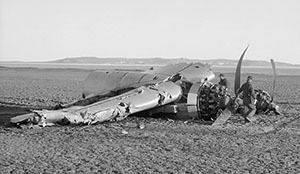 Merlin Mac Aulay sent me some scanned black & white negatives of the crashed C-47, for possible use on the Arctic C-47 Wreck page, but to my surprise some of those photos were not of the wrecked C-47 at all. They showed a severely damaged right wing with the engine and a large 3-bladed prop still attached, and a second engine with prop lying next to it. The wing, which clearly wasn't that of a C-47, had the engine hanging below it, so this could very well be the right wing of the C-82 Packet! There was a second photo showing a detailed close-up of the engine, and close inspection revealed it to be an 18 cylinder Pratt & Whitney R-2800, which powers the C-82 (among others). So apparently this really was the wing of the C-82 that had crashed here. Merlin's photos of the wing are excellent, but they did not show any identification marks. They are a dead end as far as identifying this aircraft is concerned. Then Don Shanks emailed me an old photo, taken in the very early days of the weather station, showing the C-82 fuselage lying next to one of the camp buildings, and being used as a storage shed. A nice old photo of the muddy Isachsen camp in its early days, when construction was still going on. The fuselage of the C-82, now serving as a storehouse, can be seen upper left. Photo by S. Dow. Click on the photo for a larger image. 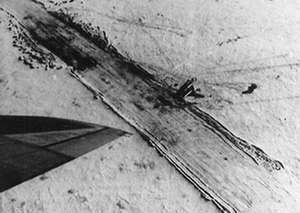 This photo showed the remains of the aircraft's buzz number on the nose. A buzz number (or buzz code) is an identification code, usually consisting of two letters and three numbers separated by a dash, which was worn by many post-war military aircraft until the 1960's and which uniquely identifies that aircraft. Unfortunately the quality of the photo was too low, and despite serious efforts no positive identification could be made. Another dead end... Apparently this mystery would not be an easy one to solve. Then I received an email from Mike Stowe of Accident-Report.Com, whom I had asked for help some time earlier. This is what he wrote: "I found a few new techniques to search for mysteries such as this one and it worked. The airplane is C-82A 48-572 from Goose Bay, which crashed at Isachsen on May 20, 1949. I have a report." Some explanation: until now it was not possible to search the official archives for accident reports if only the location and type of aircraft were known, such as in this and many other cases. Such searches required either an exact date, the aircraft's tail number, or names of crew members. I knew neither, so searching the archives was not possible. But apparently Mike now found a way around this problem. This was great news, also for future investigations, because with cases such as these, the location and aircraft type are often all we know. As with Isachsen's C-47 crash, this report too presents a wealth of interesting information, and gives a great insight in the problems surrounding the early arctic aircraft operations. One end of the airstrip was blocked by a disabled C-54D Skymaster (42-72614 msn 10719), with men working on it, replacing its #2 engine. Spare parts for this operation had just been flown in by the C-82. 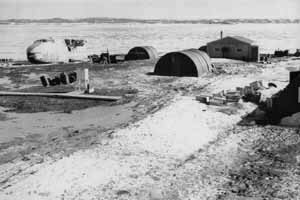 There was some urgency to this, because the C-54 needed to be repaired and flown out before the snow and ice would start to melt, transforming the airstrip into an unusable pool of mud. The C-82 crashed during the take-off run, which was performed with a bit of tailwind. This was not by choice, but by necessity, because of the C-54 that was blocking one end of the airstrip. Taking off in the direction of that C-54 was, to quote the report, "not in the interest of Flying Safety", and therefore a take-off in the other, less favourable direction was attempted. During the take-off roll, the aircraft started to veer to the left, and although the report does not give a clear reason for this, it may have had something to do with the thick cover of about 10-15 cm of soft snow. This may have been slightly thicker on the left (downwind) side of the airstrip, causing more drag for the left main gear. The pilots fought hard to keep the aircraft on the narrow airstrip, but failed. 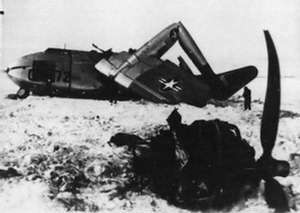 The tangled wreck of C-82A 48-572, with the torn off left engine in the foreground. This photo is taken from the official USAF accident report. Click on the photo for a larger image. Aerial view of the rudimentary airstrip at Isachsen, flanked by the wreck of the Packet. Photo taken from the official USAF accident report. Click on the photo for a larger image. The left main gear hit the base of a snow bank next to the airstrip, and a moment later the left propeller dug deep into that same snow bank. Because it was running very high power at that time (in an attempt to steer the aircraft to the right), the impact tore the entire #1 engine off the wing. Losing so much power on the left side so suddenly, with the right engine still running at reduced take-off power, caused the aircraft to make a violent left turn, completely destroying the left wing and tailboom. It then continued along the strip for another 150 meters and came to a stop, again to quote the report: "completely wrecked but in an upright position". There were no injuries. The report mentions that the wrecked left wing and tailboom were moved onto the bay ice, where they sank as the ice broke up during summer. Exactly why this was done is unclear, but it does explain why there was no trace of this wing near the old airstrip. The right wing was crudely cut off the fuselage and left at the spot, whilst the fuselage itself was moved to the camp to be used as a USAF property storehouse. It was still there in 1962, more than 13 years after the crash, and may very well still be there today. 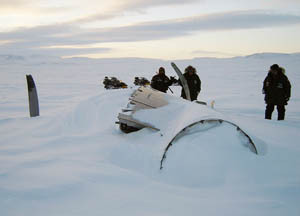 The right wing of the C-82 Packet was still present in April 2006, buried in more than a meter of snow. Photo by WO Ed Patten, First Canadian Ranger Patrol Group. Click on the photo for a larger image. One more item of note is that the accident report mentions that "favorable consideration be given to USAF procurement of C-125 Northrop Raiders or Pioneers for Arctic re-supply missions, which require flight operations from small airstrips". At that time the Northrop C-125 Raider had not yet made its first flight, and when it did it was found to be underpowered. It never became a success, and only 23 aircraft were ever built. The type saw very limited use under arctic conditions. I owe many thanks to Don Shanks, Merlin Mac Aulay and of course Mike Stowe for their invaluable help. And also to Andreas Morgner, who sent me the recent photo from 2006, and through whom I obtained permission to publish it on this webpage.